Anyway, this is the story of Mako-chan and Haru-kun. They are neighbors, and have been best friends forever. Mako’s mom is often away on business, and Mako and Haru rely on each other. Every day they playfully tease and abuse each other and joke around. Mako is so important to Haru that he often ditches his other friends, including his girlfriends, to hang out with Mako. Mako sort of just accepts this, until one day, Haru does the unthinkable- he kisses Mako! Telling her she is the most important person to him, he gathers her into his arms and kisses her. This opens up a flood of feelings for Mako. She really likes Haru, and is now totally confused. With this kiss, have things changed between them somehow? Are they dating? Is she now his girlfriend? Does he really like her? At school, shortly after the kiss, Mako is still totally confused about how to respond to Haru and exactly where they stand, when Haru suddenly announces that he has a new girlfriend! And one who he is serious about this time, too …and it’s not Mako! This totally crushes Mako. What did that kiss mean to Haru? Was it all a joke? Every time she sees Haru with his new girlfriend, Mako dies a little inside, and she can’t stop crying. Fortunately, she is not left to her misery alone. Mako is a member of the school’s Kendo club, and her club senior, Sayama-sempai, is there to see her pain and comfort her. He is a serious guy who often treats Mako with a sort of stern affection. He can see what Haru’s behavior is doing to Mako, and he tries to shield her from it as best he can. Meanwhile, Haru sees Mako being friendly with her club sempai, and slowly realizes that she may not belong to him…. 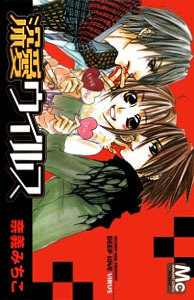 Caught in the middle of two guys who she can’t quite understand, who will Mako choose? This one shot story takes up the entire volume. I’ve encountered so many similar storylines before, but I don’t know what it is about them that keeps me coming back for more! I hope I can find a copy soon. Thanks for the recommendation (and the heads-up on the art)!